B.A. Paris had done it again! After her amazing first book Behind Closed Doors she has given us another thrilling page turner. 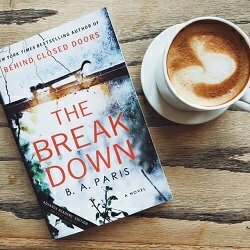 The Breakdown is a great story about a happily married woman who’s life spirals out of control after she doesn’t stop to help a woman on a dark road one night only to find she was found murdered the next morning! After that she finds she is forgetting more and more things and becoming very paranoid because of silent calls she keeps getting. She gets worse and worse until her complete breakdown. Until she finds something out that will change everything. This is a great read and a great author! If you enjoy thrillers and twists this is definitely a book for you.